Background: The type 2 diabetes is one of the most common autoimmune diseases. Due to a key role in the metabolism of unsaturated fatty acids such as arachidonic acid, one of the most important precursors of immunity mediators, fatty acid desaturase (FADS) genes could have an important impact in the development of type 2 diabetes. Materials and Methods: This study aimed to determine the relationship between polymorphisms rs174537 in FADS1 gene and rs174575 in FADS2 gene with type 2 diabetes in Iranian population. After extracting genomic DNA, the locations of mutations and allele types were identified with high-resolution melting (HRM)-polymerase chain reaction method. Then, association between these mutations with metabolic syndrome, dyslipidemia, and type 2 diabetes was investigated using χ2 correlation coefficients for variables and logistic regression. Results: The results showed that among 50 diabetic participants, 68% of patients have the mutant allele for rs174537 in FADS1 gene. This rate is 26% for rs174575 in FADS2 gene. Based on the results, it seems that participants having rs174537 mutant allele are more prone to become diabetic but it has a beneficial effect on total and low-density lipoprotein cholesterol and participants having rs174575 mutant are less prone to become diabetic, and also, it leads to higher triglycerides and body mass index (obesity). Conclusions: Detecting FADS1 and FADS2, gene polymorphisms using HRM can be an anticipating tool for making decision on initiating lifestyle modifications to prevent type 2 diabetes. Fatty acid desaturase 1 (FADS1) and FADS2 gene allele's diversity and the fatty acid composition of diet affect the lipid profile of the body. Li et al., with high-resolution melting (HRM) analysis techniques, indicated that rs174537 and rs174460 polymorphism in FADS genes can affect the plasma fatty acid concentration and desaturase enzyme activity. The amount of total cholesterol, high-density lipoproteins (HDL), low-density lipoproteins (LDL), and triglycerides in childhood influenced by FADS1 and FADS2 genes, resulting in more susceptibility to certain metabolic diseases in adults. The effect of polymorphisms in the FADS gene on the amount of long-chain PUFA (LC-PUFA) in the blood makes it an important factor in the brain development in children and susceptibility to metabolic and neurological diseases. LC-PUFA has a role in the synthesis of eicosanoids and therefore body immunity processes; it is associated to children's visual, cognitive, and motor functions,, psychological disorders and mental health,,, metabolic syndrome,,, cardiovascular disease mortality,, inflammatory and immunological responses, and other diseases such as allergies,,, resulting in its importance on human health. Recently, the role of acute inflammatory responses in developing type 2 diabetes is considered. Arachidonic acid and its metabolites are the main molecules that control the immunity mechanisms. LA and α- LA are converted to arachidonic acid by Δ5 desaturase and Δ6 desaturase enzymes, which are coded by the FADS1 and FADS2 genes. According to recent findings, the ability of these enzymes in producing immunity modulating molecules, such as prostaglandin, thromboxane, leukotriene, and lipoxin, in addition to its capability in adjusting receptors involved in immunity processes, describes its function in inflammations, the main causes of type 2 diabetes. These conversions of fatty acids to arachidonic acid show a large variation in relation to individual genetic makeup.,,,,, It has been shown that the activity of delta-5 desaturase inversely and the delta-6 desaturase directly associated to the risk of diabetes. Previous researches revealed the genetic variation in the FADS1 and FADS2 genes and finally the different prevalence of metabolic diseases in different ethnic groups., It has been shown that the changes in desaturase enzymes and fatty acid components of lipid profile are occurred earlier than any metabolic syndrome; therefore, it provides a good opportunity to prevent metabolic syndrome. In this study, the prevalence and the relationship between polymorphisms with type 2 diabetes in Iranian population were determined using rs174537 in FADS1 gene and rs174575 in FADS2 gene. Analyzing these changes and genetic diversity helps us to recognize the risk of diseases and the population at risk in Iranian people and hope to find a better way for reducing burden of disease, maybe by changing lifestyle. This study is a case–control study. The participants obtained from cardiovascular research center, Isfahan, Iran. Written informed consent were obtained from participants, and ethics committees and other relevant national regulatory organizations approved the study. Fifty diabetics and 50 nondiabetic persons were selected as case and control, respectively. As demographic factors, gender, age, weight, height, and abdominal circumference were measured, and body mass index (BMI) and abdominal obesity were calculated. Furthermore, blood samples were taken, and total, LDL, and HDL cholesterol, triglycerides, and serum aminotransferases (aspartate transaminase and alanine transaminase) were measured in blood samples. Systolic and diastolic blood pressures were measured using aneroid sphygmomanometer. After blood collection and separation of leukocytes from other blood components, genomic DNA of the cells was extracted, using Bio Genet DNA extraction kit, made in Korea (GENET BIO, Korea). The used method is the same as described in the kit instructions. Then, FADS1 and FADS2 gene promoters containing rs174537 and rs174575 single-nucleotide polymorphism were amplified using polymerase chain reaction (PCR) method. The primers used for amplification were designed by primer design software, Beacon Designer 7.5 (PREMIER Biosoft International) [Table 1]. Next, real-time PCR-HRM, applied to investigate the certain polymorphisms in FADS genes (Rotor-Gene 6000 HRM, QIAGEN, Co). HRM is a powerful and cost-beneficial method that can identify mutations using DNA strands melting curve, utilizing us to identify mutations associated with many chronic diseases, especially N2DM, a one with a massive burden. Sequencing was used for identifying unknown mutations in suspected samples that may have unfamiliar patterns. This method is the gold standard to identify suspected unknown mutations. All the procedures were repeated triplicate to minimize the errors. Data were analyzed using descriptive statistics; statistical techniques include fold equation tests and χ2 correlation coefficients for variables and logistic regression using SPSS statistical package (SPSS, Chicago, IL; Version 18.0) for windows. From 50 participants with diabetes type 2 and 50 healthy controls, DNA samples were analyzed for FADS1 rs174537 and FADS2 rs174575 polymorphisms. They were 27 males, 23 females in case group, 21 males, and 29 females in healthy control group. There is not significant difference regarding gender and age between case and control groups. The mean age of case and control group was about 15 years. The mean height and weight are approximately equal between two groups, resulting in slightly equal BMI. 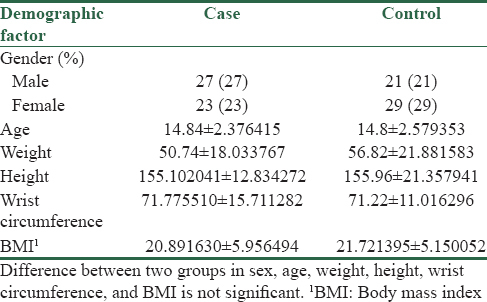 According to the definition of abdominal obesity, with equal wrist circumference, there are no differences in abdominal obesity between two groups [Table 2]. 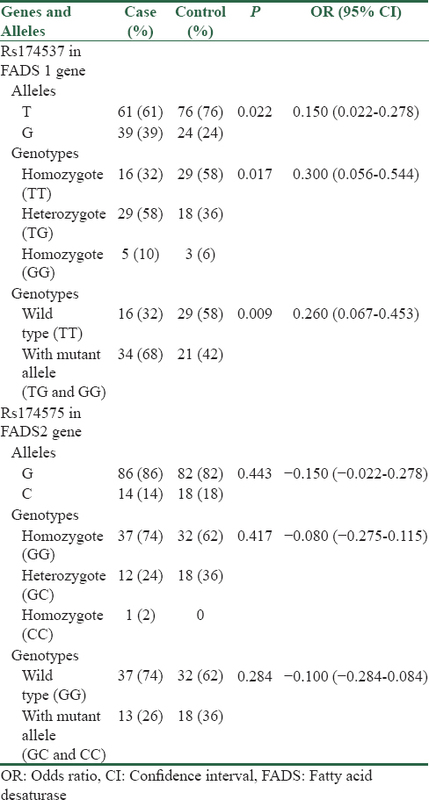 As shown in [Table 3], in FADS1 rs174537, the allele frequencies of T and G in the study population were 137 (68.5%) and 63 (31.5%), respectively. The mutant allele was significantly more frequent in the diabetic participants in comparison to healthy controls (39% vs. 24%, P = 0.022) [Table 3]. The frequencies of wild-type, mutant homozygote and heterozygote genotypes were 45 (45%), 8 (8%), and 47 (47%), respectively. The genotypes with mutant allele were significantly more frequent among diabetic cases than control participants (34% vs. 21%, P = 0.009) [Table 3]. In FADS2 rs174575, the allele frequencies of G and C in the study population were 168 (84%) and 32 (16%), respectively. 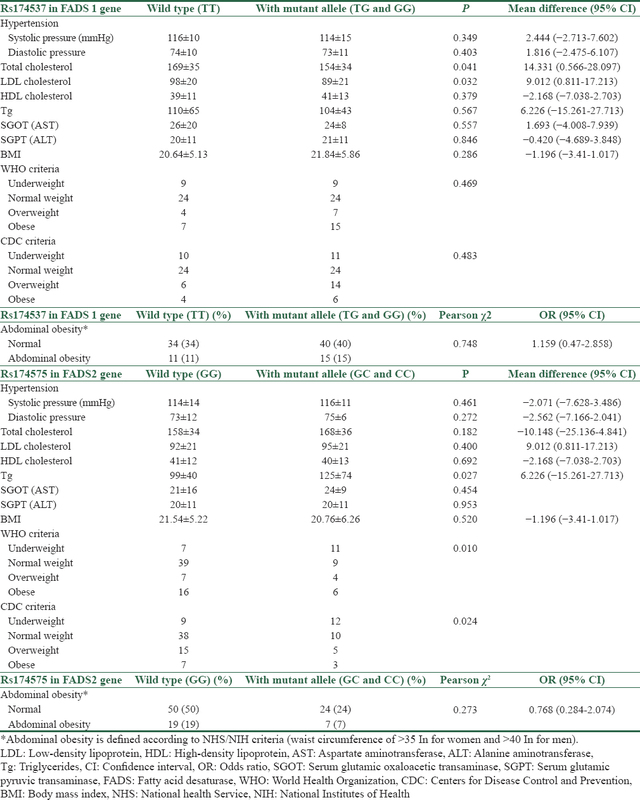 The mutant allele was inversely more frequent in healthy controls in comparison to the diabetic participants, but the difference was not significant (18% vs. 14%, P = 0.443) [Table 3]. The frequencies of wild-type, mutant homozygote and heterozygote genotypes were 69 (69%), 1 (1%), and 30 (30%), respectively. The genotypes with mutant allele were more frequent among control participants than diabetic cases (36% vs. 26%, P = 0.284) [Table 3]. There is an inverse correlation (correlation coefficient = −0.219, P = 0.028) between two mutations, meaning that it is likely to have wild-type alleles for rs174537 and mutant allele for rs174575, both protective genotypes. There are 19 participants meeting this condition which 7 (37%) of them are diabetic and 12 (63%) of them are nondiabetic. In addition, there is extremely weak correlation between age and Rs174537 mutation (correlation coefficient = 0.024) and also, between age and Rs174575 mutation (correlation coefficient = 0.076). Correlations between gender and Rs174537 mutation (correlation coefficient = 0.012) and Rs174575 mutation (correlation coefficient =−0.032) are not significant. Thus, mutations are well distributed between ages and genders. In the evaluation of FADS1 polymorphism, in comparison between participants having wild-type alleles and participants having mutant alleles, total cholesterol and LDL cholesterol were significantly higher in participants with wild-type alleles. However, triglycerides and HDL along with liver biomarkers did not show a significant difference. Abdominal obesity and BMI are not significantly different between two groups. In the evaluation of FADS2 polymorphism, only triglycerides levels are significantly higher in participants with mutant allele. Considering blood pressures higher than 135/85 as hypertension, there is no significant difference between participants having Rs174537 mutation with wild-type alleles or between participants having Rs174575 mutation with wild-type alleles [Table 4]. By defining dyslipidemia and metabolic syndrome, there are 3 persons with metabolic syndrome in participants with wild-type alleles and 10 persons in participants with mutant alleles. There are 26 persons with dyslipidemia in participants with wild-type alleles and 32 persons in participants with mutant alleles. However, there are no significant differences between two groups regarding these criteria. Classifying blood pressures to normal, prehypertension, and hypertension stage 1 and stage 2 was not resulted in significant differences between two groups [Table 5]. Rs174537 polymorphism in FADS1 gene and Rs174575 polymorphism in FADS2 gene are well distributed in both genders and different ages. In this study, there is not any evidence supporting that it occurs more frequent in older ages. According to recent studies, these polymorphisms are affected by race and ethnicity. In the current research, we conducted analysis on Iranian population and the results are consistent with global results. Rs174537 polymorphism in FADS1 gene has significant association with diabetes type 2, and Rs174575 polymorphism in FADS2 gene is inversely but not significantly associated with diabetes type 2. These results are similar to global results. The effect of Rs174537 on occurrence of diabetes type 2 is accompanied with many other factors, so patients having Rs174537 mutant allele have only 26% higher chance for getting diabetes type 2. Studies with broad range of participants are necessary to estimate its effectiveness more accurately. Patients with Rs174537 mutant allele have higher total cholesterol and LDL levels. Its effect can be attributed to desaturase activity of FADS genes. It is consistent with previous studies. The effects of FADS gene polymorphism on fatty acid concentration and plasma cholesterol level were identified earlier., Different lipid profiles of affected persons can be the predictor of tendency to be dyslipidemic. However, in case of comparing persons with mutant allele with persons having wild type, the difference is not significant. It is suggested that FADS polymorphisms along with other factors can be a contributing factor for lipid profile dysfunction. In the recent paper, it is suggested that it is possible to predict metabolic syndrome from liver enzymes. So as a new research object, effect of FADS genes on serum aminotransferase was assessed that it was not significant. The changes the mutations made do not involve liver function. However, wider researches are needed to evaluate this effect. Developing diabetes type 2 from FADS gene effect can be described in two ways: one is higher incidence of many metabolic disorders such as insulin resistance ,,, and the second is gene effect on inflammatory molecules such as arachidonic acid., In this study, we assessed the incidence of metabolic syndrome components in mutant participants in comparison to wild-type participants. Metabolic components are affected somehow inversely in two polymorphisms, from which blood pressure is measured higher in Rs174537 wild-type participants (it is vice versa in Rs174575, with lower blood pressure in wild-type participants). HDL cholesterol is higher in mutant alleles in Rs174537, but it is higher in wild-type participants in Rs174575. In addition, triglycerides are in the same condition, higher in wilds in Rs174537 and lower in wilds in Rs174575. Abdominal obesity is affected in the same way, where in both polymorphisms wild types have higher amounts. Difference in blood pressure, waist circumference, triglycerides, and HDL cholesterol was not statistically significant. The only component that is really changed is fasting blood sugar. However, it must be noted that all of metabolic syndrome components were higher in patients with mutation in Rs174575 polymorphism except abdominal obesity, but the results for Rs174575 are vice versa. The result (regarding metabolic syndrome definition criteria) is that association of metabolic syndrome with having Rs174537 mutation is somehow meaningful (P = 0.09) with a narrow distance to be significant, but amazingly, Rs174575 is quite far from being statistically significant. It is consistent with effect of two mutations in developing type 2 diabetes mellitus (T2DM). Changes in lipid profile can occur earlier to metabolic syndrome and therefore T2DM, so alterations made to lipid profile as a consequence of FADS mutations can be predictor for developing metabolic syndrome later in the life. Changes which, to a high level, can be controlled with good lifestyle interventions and therefore reduce the burden of noncommunicable diseases, especially T2DM, one of the most commons. Acting before onset is one of the key actions against diabetes. Therefore, detecting FADS1 and FADS2 gene polymorphisms using real-time PCR HRM can be valuable. It helps us to make decision earlier on initiating lifestyle modifications to prevent type 2 diabetes. Further evaluations needed to clarify the potential support it could make for this purpose. Grant for Research, Isfahan University of Medical Sciences, Experiments took place in Applied Physiology Research Center, Isfahan University of Medical Sciences. Guadarrama-López AL, Valdés-Ramos R, Martínez-Carrillo BE. Type 2 diabetes, PUFAs, and Vitamin D: Their relation to inflammation. J Immunol Res 2014;2014:860703.
WHO. Global Status Report on Noncommunicable Diseases 2014. World Health Oraganzation; 2014. p. 298. Albert MA, Glynn RJ, Buring J, Ridker PM. C-reactive protein levels among women of various ethnic groups living in the United States (from the women's health study). Am J Cardiol 2004;93:1238-42. Sergeant S, Hugenschmidt CE, Rudock ME, Ziegler JT, Ivester P, Ainsworth HC, et al. Differences in arachidonic acid levels and fatty acid desaturase (FADS) gene variants in African Americans and European Americans with diabetes or the metabolic syndrome. Br J Nutr 2012;107:547-55. Warensjö E, Sundström J, Lind L, Vessby B. Factor analysis of fatty acids in serum lipids as a measure of dietary fat quality in relation to the metabolic syndrome in men. Am J Clin Nutr 2006;84:442-8. Huang T, Bhulaidok S, Cai Z, Xu T, Xu F, Wahlqvist ML, et al. Plasma phospholipids n-3 polyunsaturated fatty acid is associated with metabolic syndrome. Mol Nutr Food Res 2010;54:1628-35. Huang T, Sun J, Chen Y, Xie H, Xu D, Huang J, et al. Genetic variants in desaturase gene, erythrocyte fatty acids, and risk for type 2 diabetes in Chinese Hans. Nutrition 2014;30:897-902. Huang T, Wahlqvist ML, Xu T, Xu A, Zhang A, Li D, et al. Increased plasma n-3 polyunsaturated fatty acid is associated with improved insulin sensitivity in type 2 diabetes in China. Mol Nutr Food Res 2010;54 Suppl 1:S112-9. Lemaitre RN, King IB, Mozaffarian D, Sotoodehnia N, Rea TD, Kuller LH, et al. Plasma phospholipid trans fatty acids, fatal ischemic heart disease, and sudden cardiac death in older adults: The cardiovascular health study. Circulation 2006;114:209-15. Shannon J, King IB, Moshofsky R, Lampe JW, Gao DL, Ray RM, et al. Erythrocyte fatty acids and breast cancer risk: A case-control study in Shanghai, China. Am J Clin Nutr 2007;85:1090-7. Innis SM. Perinatal biochemistry and physiology of long-chain polyunsaturated fatty acids. J Pediatr 2003;143:S1-8. Innis SM. Dietary omega 3 fatty acids and the developing brain. Brain Res 2008;1237:35-43. Gillingham LG, Harding SV, Rideout TC, Yurkova N, Cunnane SC, Eck PK, et al. Dietary oils and FADS1-FADS2 genetic variants modulate [13C]α-linolenic acid metabolism and plasma fatty acid composition. Am J Clin Nutr 2013;97:195-207. Li SW, Lin K, Ma P, Zhang ZL, Zhou YD, Lu SY, et al. FADS gene polymorphisms confer the risk of coronary artery disease in a Chinese Han population through the altered desaturase activities: Based on high-resolution melting analysis. PLoS One 2013;8:e55869. Standl M, Lattka E, Stach B, Koletzko S, Bauer CP, von Berg A, et al. FADS1 FADS2 gene cluster, PUFA intake and blood lipids in children: Results from the GINIplus and LISAplus studies. PLoS One 2012;7:e37780. Nakamura MT, Nara TY. Structure, function, and dietary regulation of delta6, delta5, and delta9 desaturases. Annu Rev Nutr 2004;24:345-76. Beblo S, Reinhardt H, Demmelmair H, Muntau AC, Koletzko B. Effect of fish oil supplementation on fatty acid status, coordination, and fine motor skills in children with phenylketonuria. J Pediatr 2007;150:479-84. Koletzko B, Cetin I, Brenna JT; Perinatal Lipid Intake Working Group, Child Health Foundation, Diabetic Pregnancy Study Group, et al. Dietary fat intakes for pregnant and lactating women. Br J Nutr 2007;98:873-7. Maes M, Smith R, Christophe A, Cosyns P, Desnyder R, Meltzer H, et al. Fatty acid composition in major depression: Decreased omega 3 fractions in cholesteryl esters and increased C20: 4 omega 6/C20:5 omega 3 ratio in cholesteryl esters and phospholipids. J Affect Disord 1996;38:35-46. Muskiet FA, Kemperman RF. Folate and long-chain polyunsaturated fatty acids in psychiatric disease. J Nutr Biochem 2006;17:717-27. Nakada T, Kwee IL, Ellis WG. Membrane fatty acid composition shows delta-6-desaturase abnormalities in Alzheimer's disease. Neuroreport 1990;1:153-5. Das UN. Essential fatty acid metabolism in patients with essential hypertension, diabetes mellitus and coronary heart disease. Prostaglandins Leukot Essent Fatty Acids 1995;52:387-91.
van Doormaal JJ, Muskiet FA, van Ballegooie E, Sluiter WJ, Doorenbos H. The plasma and erythrocyte fatty acid composition of poorly controlled, insulin-dependent (type I) diabetic patients and the effect of improved metabolic control. Clin Chim Acta 1984;144:203-12. Vessby B. Dietary fat, fatty acid composition in plasma and the metabolic syndrome. Curr Opin Lipidol 2003;14:15-9. Glew RH, Okolie H, Huang YS, Chuang LT, Suberu O, Crossey M, et al. Abnormalities in the fatty-acid composition of the serum phospholipids of stroke patients. J Natl Med Assoc 2004;96:826-32. Leaf A. Prevention of sudden cardiac death by n-3 polyunsaturated fatty acids. Fundam Clin Pharmacol 2006;20:525-38. Goldring MB, Berenbaum F. The regulation of chondrocyte function by proinflammatory mediators: Prostaglandins and nitric oxide. Clin Orthop Relat Res 2004;427 S37-46. Duchén K, Björkstén B. Polyunsaturated n-3 fatty acids and the development of atopic disease. Lipids 2001;36:1033-42. Kompauer I, Demmelmair H, Koletzko B, Bolte G, Linseisen J, Heinrich J, et al. Association of fatty acids in serum phospholipids with hay fever, specific and total immunoglobulin E. Br J Nutr 2005;93:529-35. Trak-Fellermeier MA, Brasche S, Winkler G, Koletzko B, Heinrich J. Food and fatty acid intake and atopic disease in adults. Eur Respir J 2004;23:575-82. Lattka E, Illig T, Heinrich J, Koletzko B. Do FADS genotypes enhance our knowledge about fatty acid related phenotypes? Clin Nutr 2010;29:277-87. Guillou H, Zadravec D, Martin PG, Jacobsson A. The key roles of elongases and desaturases in mammalian fatty acid metabolism: Insights from transgenic mice. Prog Lipid Res 2010;49:186-99. Malerba G, Schaeffer L, Xumerle L, Klopp N, Trabetti E, Biscuola M, et al. SNPs of the FADS gene cluster are associated with polyunsaturated fatty acids in a cohort of patients with cardiovascular disease. Lipids 2008;43:289-99. Martinelli N, Girelli D, Malerba G, Guarini P, Illig T, Trabetti E, et al. FADS genotypes and desaturase activity estimated by the ratio of arachidonic acid to linoleic acid are associated with inflammation and coronary artery disease. Am J Clin Nutr 2008;88:941-9. Rzehak P, Heinrich J, Klopp N, Schaeffer L, Hoff S, Wolfram G, et al. Evidence for an association between genetic variants of the fatty acid desaturase 1 fatty acid desaturase 2 (FADS1 FADS2) gene cluster and the fatty acid composition of erythrocyte membranes. Br J Nutr 2009;101:20-6. Schaeffer L, Gohlke H, Müller M, Heid IM, Palmer LJ, Kompauer I, et al. Common genetic variants of the FADS1 FADS2 gene cluster and their reconstructed haplotypes are associated with the fatty acid composition in phospholipids. Hum Mol Genet 2006;15:1745-56. Xie L, Innis SM. Genetic variants of the FADS1 FADS2 gene cluster are associated with altered (n-6) and (n-3) essential fatty acids in plasma and erythrocyte phospholipids in women during pregnancy and in breast milk during lactation. J Nutr 2008;138:2222-8. Kröger J, Schulze MB. Recent insights into the relation of Δ5 desaturase and Δ6 desaturase activity to the development of type 2 diabetes. Curr Opin Lipidol 2012;23:4-10. Warensjö E, Rosell M, Hellenius ML, Vessby B, De Faire U, Risérus U, et al. Associations between estimated fatty acid desaturase activities in serum lipids and adipose tissue in humans: Links to obesity and insulin resistance. Lipids Health Dis 2009;8:37. Vessby B, Gustafsson IB, Tengblad S, Boberg M, Andersson A. Desaturation and elongation of fatty acids and insulin action. Ann N Y Acad Sci 2002;967:183-95. Dupuis J, Langenberg C, Prokopenko I, Saxena R, Soranzo N, Jackson AU, et al. New genetic loci implicated in fasting glucose homeostasis and their impact on type 2 diabetes risk. Nat Genet 2010;42:105-16. Florez JC, Jablonski KA, McAteer JB, Franks PW, Mason CC, Mather K, et al. Effects of genetic variants previously associated with fasting glucose and insulin in the diabetes prevention program. PLoS One 2012;7:e44424. Ingelsson E, Langenberg C, Hivert MF, Prokopenko I, Lyssenko V, Dupuis J, et al. Detailed physiologic characterization reveals diverse mechanisms for novel genetic loci regulating glucose and insulin metabolism in humans. Diabetes 2010;59:1266-75. Kim OY, Lim HH, Yang LI, Chae JS, Lee JH. Fatty acid desaturase (FADS) gene polymorphisms and insulin resistance in association with serum phospholipid polyunsaturated fatty acid composition in healthy Korean men: Cross-sectional study. Nutr Metab (Lond) 2011;8:24. Lu Y, Feskens EJ, Dollé ME, Imholz S, Verschuren WM, Müller M, et al. Dietary n-3 and n-6 polyunsaturated fatty acid intake interacts with FADS1 genetic variation to affect total and HDL-cholesterol concentrations in the doetinchem cohort study. Am J Clin Nutr 2010;92:258-65. Sjögren P, Sierra-Johnson J, Gertow K, Rosell M, Vessby B, de Faire U, et al. Fatty acid desaturases in human adipose tissue: Relationships between gene expression, desaturation indexes and insulin resistance. Diabetologia 2008;51:328-35.